Is this the full moon, low in the sky, shining softly on the snow on a cold winter night? 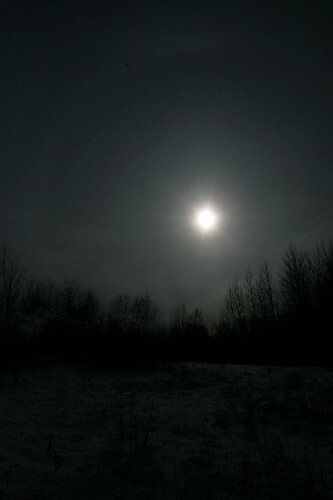 Actually, it was taken this afternoon at 1pm, the sun already starting to dip toward the horizon. Exposure bias was set -2 steps to try to capture the sun as an identifiable object and not simply a bright wash in the sky. The night-like result wasn’t my intention, but I think it’s neat how easily our perception of something can be tricked with a camera. Very nice! I continue to struggle with the digital camera – most good pics are purely accidental! There’s definitely a learning curve, Ellen. It took me about a year before I really began to feel comfortable with mine, and I attribute a lot of that to reading The Digital Photography Book by Scott Kelby, which is a super easy-to-read, straightforward explanation not only of the whats of using your camera, but also the whys (and it’s these whys that really make it stick!). I highly recommend it. Nice! The height of the treetops produces a nice vignetting effect.